With his win of the Jag Metals 350 at Texas Motor Speedway on Friday night, reigning NASCAR Camping World Truck Series champion Johnny Sauter clinched is spot in the 2017 Championship Four for the season finale Nov. 17 at Homestead-Miami Speedway, leaving three positions up for grabs among five drivers heading into the Nov. 10 race at Phoenix International Raceway, the second-to-last race of the season. 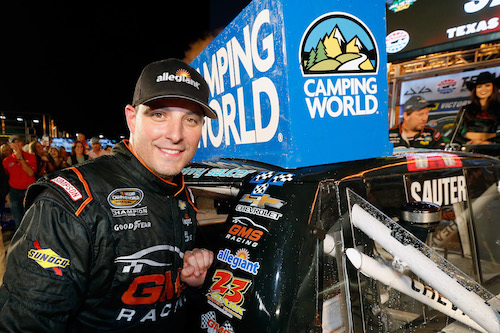 “Now, we look to Homestead to try and win another championship,” Sauter said. Bell leads the way among the other five drivers with a 31-point cushion on Matt Crafton, third in points behind Bell and Sauter. Austin Cindric is on the provisional bubble, heading into the PIR race, 19 points behind Crafton and five points ahead of the first driver provisionally out, Ben Rhodes. Rhodes and John Hunter Nemechek find themselves on the outside looking in, heading into Phoenix, after pit road issues at Texas. As a result, Rhodes and Nemechek wound up with 18th and 19th-place finish at TMS. During the only green-flag cycle of stops that began on lap 117 of the 147-lap race, Rhodes’ team had an issue with a pit gun that resulted in a slow stop and a return trip to the pits for Rhodes to tighten lug nuts. Nemechek’s team, in a win or be eliminated mindset, went into fuel conservation mode, planning to run the entire 77-lap final stage without pitting. Those plans were aborted, though, on lap 134. Running on fuel, his truck stalled on pit road, lengthening Nemechek’s time on pit road. “We gambled it and it didn’t work out,” Nemecheck said. While Rhodes still could possibly points his way in, Nemechek is nearly in a win-or-be-eliminated situation, heading into the Phoenix race. He’s 39 points behind Cindric.